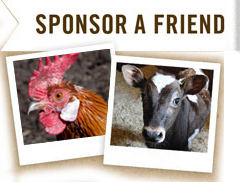 Who knows Maple Farm Sanctuary’s animal residents best? The kind and compassionate people who volunteer their time to give these furry, wooly, and feathery friends the best life possible! "Putt Putt, our sweet senior goat, has impaired vision in one eye. I call him my handsome pirate!"